Austrian Hebraist and educator; born in Lemberg Jan. 23, 1826. After receiving the usual rabbinical education, he took up, at the age of fifteen, the study of Neo-Hebrew and modern languages. In 1860 he became head teacher of a Jewish school in Czernowitz, Bukowina, and in 1867 a teacher of Jewish religion in the gymnasium and the general schools of Suchaw, Moravia. In 1867 he became director of a Jewish school in Foltichani, Rumania, where he occasionally officiated as preacher. In 1869 he was called to Jassy to the positions of preacher in the Reform synagogue and director of the Jewish orphan asylum. He retired from these offices in 1885. He had one daughter, Sabina, and two sons, Leo (army physician) and Emil (merchant and musical composer). 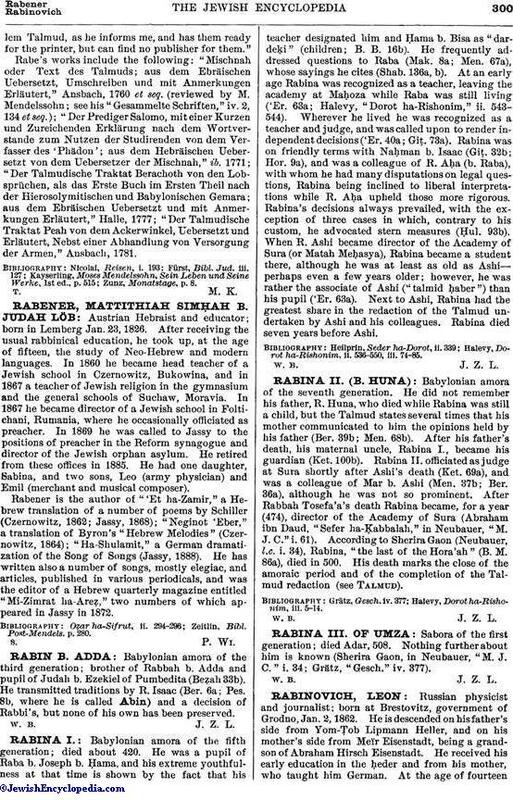 Rabener is the author of "'Et ha-Zamir," a Hebrew translation of a number of poems by Schiller (Czernowitz, 1862; Jassy, 1868); "Neginot 'Eber," a translation of Byron's "Hebrew Melodies" (Czernowitz, 1864); "Ha-Shulamit," a German dramatization of the Song of Songs (Jassy, 1888). He has written also a number of songs, mostly elegiac, and articles, published in various periodicals, and was the editor of a Hebrew quarterly magazine entitled "Mi-Zimrat ha-Areẓ," two numbers of which appeared in Jassy in 1872. Zeitlin, Bibl. Post-Mendels, p. 280.